To me, that is a highly offensive question. Does he seriously think that oil company executives believe that these prices are good for the economy? I know – and I have personally heard one oil company CEO say this in a small private meeting with employees – that they want to see prices cool off. Durbin is pointing fingers directly – “This is your fault” – and then implying malice. Durbin either believes that oil prices are going up because oil companies are making them go up, or he actually knows better and would rather throw these guys to the wolves than have a serious discussion on energy policy. I am troubled by either option. Not “hapless victims”, Senator Feinstein. Beneficiaries of higher oil prices, to be sure. But they are beneficiaries of a system that is the result of bidding in a global market. These executives have little power to influence that. But senators became incredulous when Lowe was unable to tell the committee chairman, Sen. Patrick J. Leahy (D-Vt.), how much he earned last year. “I wish I made enough money that I didn’t even have to know how much I made,” Leahy said. Yet I bet if Leahy was asked that question under oath, he would have trouble answering it exactly. After all, most people can state their base compensation, but throw in interest payments and any other odds and ends, and you are suddenly at risk of perjury by stating the amount incorrectly. But hey, it makes for a good sound bite. “People we represent are hurting, the companies you represent are profiting,” Sen. Patrick Leahy, D-Vt., told the executives. He said there’s a “disconnect” between legitimate supply issues and the oil and gasoline prices motorists are seeing. Why is that ignorant? Because it presumes to define how high prices should be given a supply/demand imbalance. Does he think – as I have seen some suggest – that a 10% imbalance in supply and demand should cause prices to go up by 10%? Here’s an analogy I have used before in this case. Imagine that everyone in the world requires a certain substance every day, otherwise they die. How high would prices go if there was a 10% shortage of this substance? 10%? You have to be kidding. People would be willing to pay literally anything to get the substance. In the case of such a substance, any shortfall is going to have a disproportionate impact on the price. And in the case that the substance is a diminishing resource, over time you would have the rich bidding against each other and driving the price far higher than might seem rational. 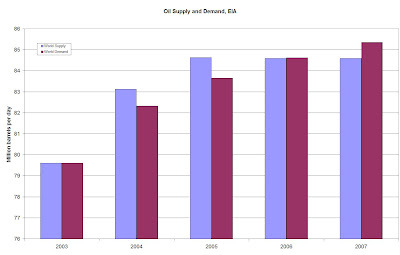 While oil is not quite in that category, it is a highly demanded commodity, and demand is pretty inelastic. Shortfalls are going to disproportionately impact price. Look at the graphic up top. Supply and demand are out of balance, and the price is rising to bring them into balance. That some of our fine senators are too ignorant to understand the implications does not bode well for the U.S. to ever have a comprehensive, consistent energy policy. Finally, why are oil and gas prices rising? Gas prices are being driven by oil price increases (whereas last year they were driven by low inventories). Funny that the committee would focus so much on gas prices, when the refining sector has seen profits all but vanish. Presently, oil company profits are being driven by high oil prices, and most of that oil is extracted from outside the U.S. So why are prices rising? I believe this is Peak Lite in action. For those unfamiliar, the concept of Peak Lite is that we will have shortfalls and huge price increases before oil production actually peaks. This is what we are seeing now. Even as we are setting new production records, demand has far outstripped new supply. The concept of Peak Lite is explained here: Peak Lite Revisited.